Situated across the street from the Federal Courthouse, and close to many restaurants and other amenities, this office building boasts breathtaking views of the Reno valley. Offering a full range of spacious workplace solutions to clients, as well as a comfortable business lounge. With exceptional and breathtaking views of Mt. Rose and an incredible number of high quality facilities and executive professional provisions available on site, these fantastic Reno office suites are all furnished in a modern and largely contemporary style, with a number of technological provisions and inclusions. Free parking is available on-site while you will be just one block from the I-580 for good road links. Office space located close to many nearby amenities, such as restaurants, shops, casinos, the courthouses, and to the Riverwalk. This facility is also close to the Tahoe International Airport making this a very accessible location for the business minded traveller. 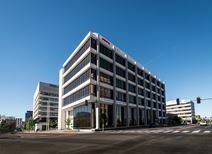 Offices are offered fully furnished and include flexible lease arrangements.